Are you living for the weekend? Are you dissatisfied at work? Are you itching to do something that is important to you? How can you avoid the pitfalls that many first-time entrepreneurs have fallen into? How do you explore whether entrepreneurship is right for you without giving up your day job? Employee to Entrepreneur is your guide to leaving your job behind and building something for yourself. 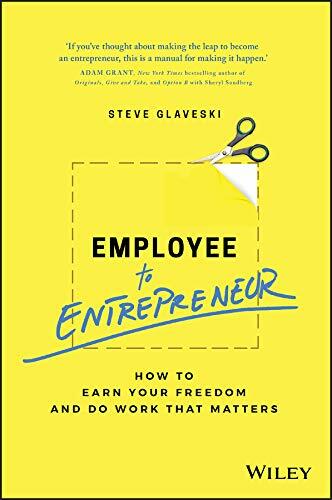 Author and employee-turned-entrepreneur Steve Glaveski, shows you how to navigate the challenges, find the entrepreneurial success that is right for you and become a better person along the way. 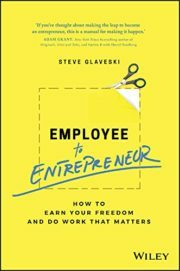 Employee to Entrepreneur combines storytelling with a step-by-step framework to teach you how to effectively explore and leverage entrepreneurship to gain freedom, fulfillment and financial security. develop the mindset to succeed in your business. If you’re ready to leave your cushy employee life behind and build a business and a life you believe in, reading this essential guidebook is your first step to making it happen.